A signed Permission slip is required for this trip. If you do not have the slip that was distributed in class, you may print a new one from here. 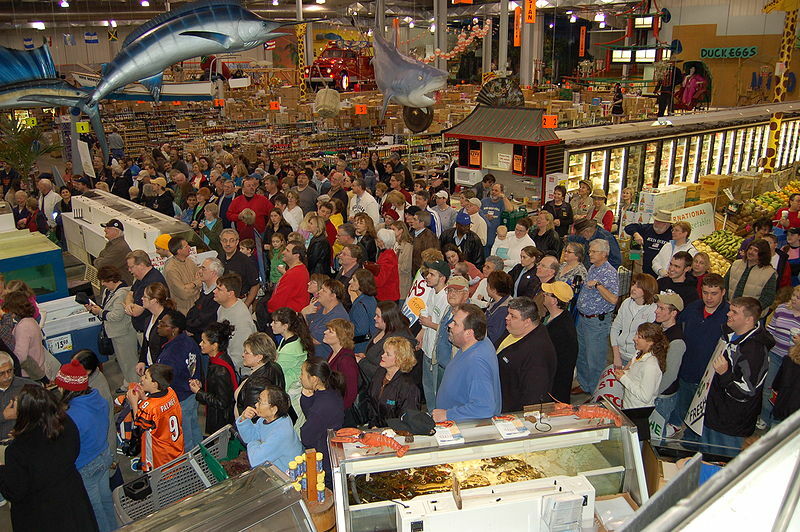 A crowd watches as ABC News Program “Good Morning America” broadcasts live from Jungle Jim’s. Jungle Jim’s has over 96,000 fans on Facebook. a 300,000-square-foot site – that’s 6 ½ acres under roof! No wonder this mega-store is able to generate sales that far exceed $1 million dollars per week. There are lots of other shops and restaurants on the property as well: Starbucks and Rib City, Cici’s Pizza and a pet store, a dentist and a jewelry store, a bank and a post office. Currently, the best-selling categories for international foods at Jungle Jim’s right now are Hispanic, Italian, and Asian. The company is also experiencing high growth specifically with Indian foods. Jungle Jim’s has been featured on the Food Network show Unwrapped, as well as ABC News’ Good Morning America. Last month (Oct 29) the History Channel’s Modern Marvels featured Jungle Jim’s. Modern Marvels is a documentary series that features how technologies affect and are used in today’s society. I love this post! It looks great. One comment is that much of the information is old and not true anymore; (450 employees, over 73 countries represented, 1200 beers and 12,000 wines, 75,000 customers per week, etc. You’ll find out the real information when you visit! Have fun and we’re happy you are coming to visit. Thank you Debbie, and we are looking forward to meeting you. We are also excited about learning some of the cool behind-the-scenes info concerning what it takes to operate a wildly successful business such as yours. Wow, thats amazing! The place is filled with all kinds of food and drinks. This is giong to be a good trip and a good experience.